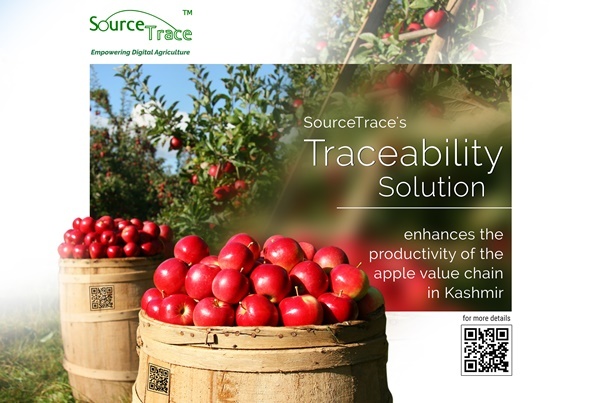 How SourceTrace traceability solution assist fruit master to transform the apple value chain? Welcome to the Kashmir Valley, and to the breath-taking views of its apple orchards. As India’s major apple basket, 90 percent of Kashmir’s horticultural area is under apple cultivation, spreading across nearly 165,000 hectares, next only to China. Kashmir apples are superior in taste –being sweet and juicy, it is popular in the market, but also more expensive than many other apples coming from other countries. On the downside, the productivity is low, at about 2.2 million tons. Yet, the potential of growing apples is huge, and with a little help from digital technology, this low productivity statistic is all set to shift. 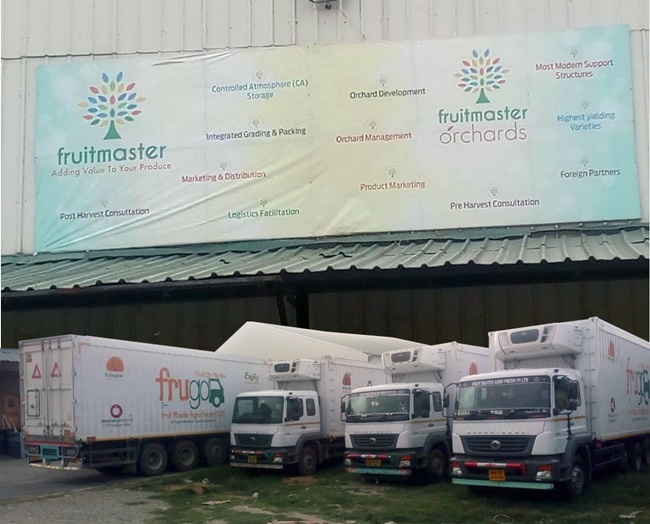 Here’s the story of how SourceTrace’s digital solutions, deployed by Fruitmaster Agro Fresh Pvt.Ltd., is completely transforming the management of their apple value chain, particularly by digitally connecting every step from pre-harvest to post-harvest, for the first time since 40 years of it’s setting up. Fruitmaster AgroFresh Pvt.Ltd operates out of Kashmir and is a joint enterprise run by three families: the Bhat family, who has been working with the apple cultivation industry for four decades, the Burza family, who are investors in the State’s horticulture scene, and the Suri family, who specializes in marketing & distribution networks. Thus, Fruitmaster is engaged not only with the cultivation of apples but also in its grading, packing, storing, transport and marketing – in effect, they manage the entire supply chain from orchard to market, with state-of-the-art facilities for storage and transport. The apple growers or farmers have been connected with the company for a long time, having been through thick and thin together. During the pre-harvest, Fruitmaster provides the farmers with turnkey solutions for orchard development and advisory about the appropriate varieties to plant, along with the design and layout of the orchard. An in-house pathology team addresses queries of the farmers in case of disease or pest attack. While a number of varieties of apples are grown, the key ones are red delicious, golden delicious, gala and Fuji, which sell well in the domestic market, as the Indian market takes much better to the sweet and juicy varieties, rather than to the acidic varieties of cooking apples. What does Fruitmaster expect from the implementation of SourceTrace’s traceability solution? “We expect a four times increase in the quantity of produce and a 65-90% increase in quality”, says Uzair Javeed, Chief Operating Officer at Fruitmaster. With all data that is being collected through SourceTrace’s application, cultivation is becoming a far more scientifically-managed activity than it used to be. As a result, the farmers’ income will increase too. That’s a big supporting factor for improving their livelihoods. Javeed is of the opinion that whenever there is a need to take a comprehensive, hard look at their own systems, they absolutely need the facts to be in the right place. For example, SourceTrace’s traceability solution has made the operations so transparent, that even the chemicals used can be tracked by the consumer, according to Javeed. In Kashmir, the landholdings are small but there are a good number of growers. In such a scenario, SourceTrace’s platform is helpful, as it can be used to collect and aggregate every kind of data. “It doesn’t matter whether we are dealing with a single orchard or hundreds of them, data is required at every step – to make policy decisions, to integrate with banks, to provide feedback and explanations to the farmers, or to share with government agencies. We need numbers, which we did not have till date”, explains Javeed. As of now, the company has begun the process of enrollment of the farmers one by one, and eventually, they will all be connected on SourceTrace’s platform. This year, the commercial plantation on 25 hectares is set to begin, which will soon expand to 1500 hectares. Where they have 1000-2000 farmers enrolled as of now, the number will hit 10,000 in the next 5 years, and it’s going to be used to improve both the quality and quantity of apple. Fruitmaster is aware of the benefits of having real-time, complete information at hand. Moreover, they expect the data capture framework to be dynamic, with new fields and information being added as and when required. The enterprise wants accurate and updated data, in order to make policy decisions. For example, knowing orchard locations of particular varieties through the data collected helps in procurement with much greater ease, without having to travel up and down through the orchards. SourceTrace’s traceability solutions have also put the spotlight on chemicals used. They can now tally the quality of the apples with the chemicals used, which was not possible to do earlier. The other way in which traceability helps is in linking the various flavors of apples with the corresponding areas in which they are grown. It can also pinpoint diseases that occur in specific areas. Javeed reiterates that it is important to have accurate data, and is happy that the traceability solutions have brought in the much-sought-after transparency. he explains. For example, an outbreak of a disease, instantly recorded, helps in a general advisory to the farmers, broadcasting alerts about control mechanisms and remedies. Fruitmaster has enrolled all their current orchards onto the platform, with more orchards and growers moving into the system. Besides, the solution brings all farmers and the in-house team onto a common platform for knowledge sharing. There should be enough information available on hand for the consumer also to make a decision on whether to buy our apples, says Javeed. The feather on the cap is that they will also use SourceTrace’s application as a designing tool for the orchard, using google maps available on the platform.